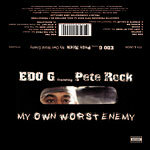 MY OWN WORST ENEMY is a collaboration between Boston Based Hip Hop Veteran EDO.G and the legendary Hip Hop producer Pete Rock. The 10 track release is produced by Pete Rock with additional production by Diamond D and DJ Revolution featuring Jaysaun, Masta Ace, Diamond D, and Pete Rock. MY OWN WORST ENEMY was originally released in 2004 on Vinyl and CD only. This 10 Year Anniversary edition is now available for the first time on a chrome cassette tape in a Red Tint Colored Cassette Shell. Limited to a 100 piece pressing. Place your order now while supplies last. All songs produced by Pete Rock except: 5 by Diamond D, 7 by DJ Supreme One & 10 by DJ Revolution. All cuts by Pete Rock except: 10 by DJ Revolution.